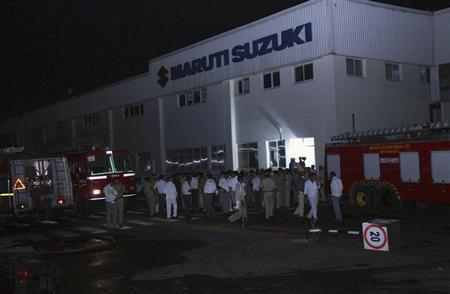 A Gurgaon court on Saturday awarded life sentence to 13 former employees of Maruti-Suzuki India Limited, who it had found guilty of murder, in connection with the violence at the automobile giant's Manesar plant in 2012 in which a senior company officer had died. Additional district and session judge RP Goyal granted life sentence to the 13 men, who had been convicted for murder by it earlier. Of the 18 other ex-workers, who had been convicted of various other offences like violence, rioting and attempt to murder, four have been given a sentence of 5 years. Fourteen other convicts would be released after paying a fixed amount of Rs 2,500 as fine. The court termed these 14 as "undergone accused" as they had already served a jail term of four and half years, which it felt was enough punishment. The 13 persons who have been sentenced to life term are identified as Ram Mehar, who was the union president, Sandeep Dhillon, Ram Bilas, Sarabjeet Singh, Pawan Kumar, Sohan Kumar, Pradeep Kumar, Ajmer Singh, Jiya Lal, Amarjeet, Dhanraj Bhambi, Yogesh Kumar and Pradeep Gujjar. During the proceedings, the prosecution counsel Anurag Hooda sought death penalty for all the 13 murder convicted employees. Sessions judge R P Goyal, after taking into consideration all aspects, awarded life sentence to each of them. Defense counsel, Rebbecca John however said she would approach the High Court against the decision. Violence had erupted at the facility in August 2012 over disciplinary action against an employee during which agitated workers went on rampage, torching a part of the factory, setting senior human resource manager Awanish Kumar Dev on fire, and beating up and bludgeoning with rods 100 others. Those wounded included some foreigners and policemen. The police had arrested 148 workers in connection with the murder. Hundreds of policemen in riot gear were on Saturday deployed at the court and outside automakers offices' over threats by workers to mobilise large-scale protests if their colleagues "did not get justice".